Ready for the home gardener right out of the bag. Use as a top dressing for lawns and gardens as well as a base for custom mixes. The coarse fiber texture of peat moss keeps the soil moist, yet well-aerated and supplies the acidity so necessary for plants to thrive. A great addition to loosen heavy clay soils or bind sandy soils. No other soil amendment provides this combination of benefits. No dust and no pre-wetting needed. Partially decomposed and dry sphagnum moss. It’s large cell structure enables it to absorb air and water like a sponge. Although peat moss does not contain nutrients, it adsorbs nutrients added to or present in the soil releasing them over time as the plants require. This saves valuable nutrients which are otherwise lost through leaching. Provides the right balance of air and water for plants and grass. Loosens clay soils and binds sandy soils. No other soil amendment provides this combination of benefits. Note: this product is dry and is harder to use then pre-moistened sphagnum moss as it commonly blows away in the wind. 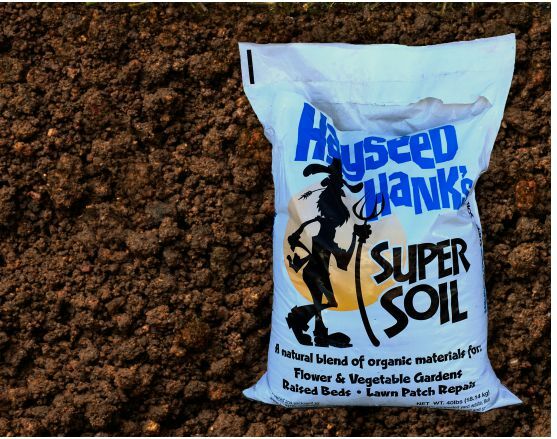 Hayseed Hank’s Super Soil is an enriched soil created from a screened blend of topsoil, Bull Country Compost and composted yard waste. Nutrient rich and does not require any additional compost or fertilizer. Use it to fill a raised bed, create a new garden, boost new plantings, patch existing lawns, new lawn install or for potted plants. Helps prevent nutrients from leaching away. Enriched with Myco-tone® and fortified with worm castings. Aerates Soils for Better Root Growthates soil and promotes root growth.